Use of sea buckthorn oil in cosmetologyis a great discovery. It is an affordable agent for eliminating many cosmetic problems and at the same time it "gets along" great with the skin of any type. Knowing a variety of ways how to use this product will make you closer to the ideal complexion. The healing properties of sea buckthorn oil come from its composition, which are really impressive. Here are the ingredients that are rich in this valuable product: Vitamins A, E, C, A, F, P, B1, B2 and B6. The main component of the healing oil is a carotene, a type of vitamin A; fatty acids (oleic, palmitoleic, stearic, palmitic); organic acids (malic, oxalic, salicylic, tartaric, succinic); macro- and microelements (calcium, magnesium, iron, silicon, molybdenum, manganese, etc. ); other useful components (amino acids, phospholipids, phytosterols, volatile, pectins, flavonoids, serotonin, tannins and others). Looking at the composition of this product, it is difficult to overestimate the benefits of sea buckthorn oil for the skin. First of all it is indispensable for dry and aging skin, because it gives elasticity, hydration and it smoothens fine wrinkles. It nourishes skin and nourishes it with moisture, improves the metabolism in them; it softens rough skin, making it silky; it helps slow down the aging of skin, improving its tone; lightens freckles and age spots; It fights inflammation due to wound healing and anti-bacterial function; it treats peeling and dry skin and lips; regulates fat balance in the skin; has a powerful healing effect (reduces swelling, heals wounds and fractures); strengthens and nourishes eyelashes and eyebrows. How to choose right oil? 1. At external use and skin problems at least 300 carotenoids per 100g of cold-pressed oil. 2. For cosmetic purposes for use in creams or oils. At least 150 carotenoids per 100g of cold-pressed unrefined oil. 3.For internal use at least 150 carotenoids of cold-pressed unrefined oil. High quality oil with high content of carotenoids has hazel color. The more carotenoids are in the oil the darker color it has. At 150 -180 it is dark red color and at 300 it is dark brown color. All oils, having light magenta or orange color, are not effective and will not help you to solve your problems. Buy only high quality oil. Pay attention to quantity of carotenoids and color. If 180 carotenoids are indicated and not very dark liquid in the bottle it is a deceit. Pay attention to the color of this oil. This is the oil containing 300 carotenoids. Here there are 150 carotenoids. Don’t let be cheated. Let’s count them: aging skin that lost the elasticity; wrinkles and other irregularities on the skin of the face; dry and damaged skin (including after chapping) that needs moisture and nutrition; oily and problem skin; skin rashes, inflammations, wounds, fractures, burns and other dermatological problems; unwanted pigmentation; swelling; roughspots of the skin. 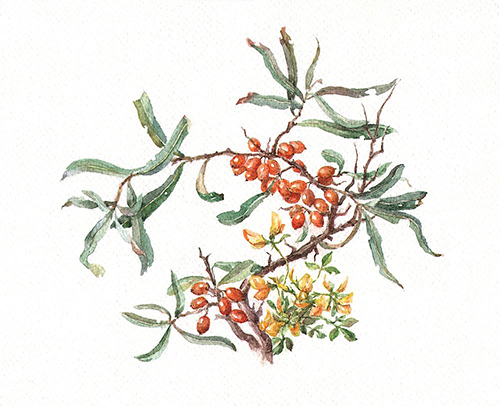 Allergy to sea buckthorn or its individual intolerance; open skin lesions; during pregnancy and lactation, when the smell of this product may cause nausea and later its intolerance; inflammatory processes in internal organs - liver, stomach, gall bladder (at internal use). Highly concentrated product is not recommended to apply on the skin in a pure form because of large percentage of carotenein its composition can weaken the protective barrier of the skin and even cause allergies (at high skin sensitivity). In addition to that if the product is kept on the face for long time, the skin will get bright orange color and it will be extremely difficult to remove it. Remember one more tip: for application on the skin, use a product, made by cold pressing, not by cold extraction, as the oil of last production technique can be toxic to the skin. With so many beneficial properties of sea buckthorn oil its regular use is possible in different cosmetic variations. Make a note of the following ones: pure product is accepted to use for lotions and compresses; in combination with other components it is used as a mask for face; it is recommended to add oil in a cream for dry skin (2 drops are enough for a single cream portion); suitable for massaging the facial skin (in combination with other oils); massaging problem areas on the face (acne, wounds, fractures, etc..), rubbing oily skin with enlarged pores and black dots; moisturizing and nourishing dry and chapped lips; massagingthe age spots and freckles for the purpose of their whitening; applying oil on eyelashes (the best way using a brush from mascara) for their strengthening. Usually this valuable product is used in cosmetology externally. 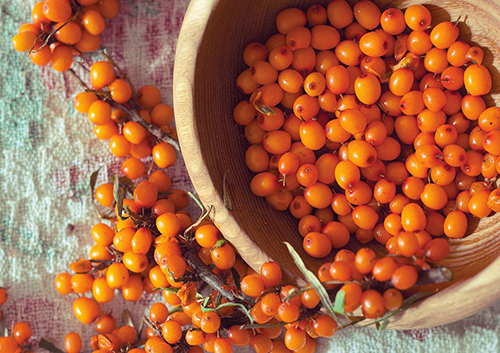 One of the main functions of sea buckthorn oil for the skin is its rejuvenation and wrinkle control. There is a wide variety of anti-aging masks in which the leading role is given in particular to sea buckthorn oil. 1. Mix sea buckthorn oil, egg yolk and home-made sour cream in equal proportions. Apply this mix on your face for 15 minutes, for better effect cover with food wrap (with holes for the nose, mouth and eyes). After that rinse with warm water. 2. Take 2 teaspoons of sea buckthorn oil, 2 tablespoons of thick warm semolina, boiled in milk, 1 teaspoon of liquid honey, half a teaspoon of sea salt, one egg yolk, 1 tablespoon of apple juice. Mix all the ingredients and apply the mixture on your face for 25 minutes. Rinse first with warm water, then with cool water. 3. Take sea buckthorn oil, aloe juice and honey in ratio of 2: 1: 1. For better effect, you can add to the mix a few drops of rose oil or rosa geranium. In 30 minutes after applying rinse the mask with warm water. Sea-buckthorn oil (a teaspoon) mixed with egg yolk, 2 teaspoons of any fresh juice (options: orange, tangerine, apple, grape, watermelon, kiwi, melon, peach, plum, and apricot). Honey (a teaspoon) is mixed with warm milk (3 tablespoons) and stirred until its complete dissolution. Mix this honey milk with warm sea buckthorn oil (a teaspoon) and add fat cottage cheese (a tablespoon). Sea buckthorn oil(a teaspoon) is mixed with raw egg yolk and yellow cosmetic clay (a teaspoon).